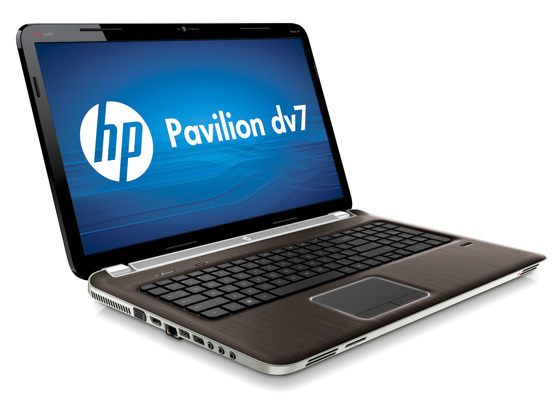 Review Heave the 3kg HP dv7 from its enormous box and you can’t help but have your hopes raised: this is a notebook that gives the impression of high-end consumer tech promise. The brushed silver back has a refined air to it and Apple stylee, the HP logo lights up using the screen’s LED lamps. Appearances aside, there are tech treats within as this machine has AMD’s Sandy Bridge competitor, Llano, a 32nm chip with an integrated GPU. Unfold the system and the excitement fades slightly – the dv7 isn’t ugly, per se, but the inside is not as enticing as its exterior. The keyboard isn’t a particularly shining example, as there’s a definite cheapness to. 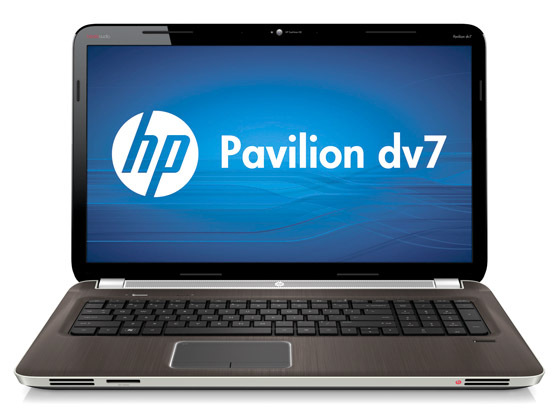 The keys are rather clacky and a slightly hollow feel underlines the dv7’s place as a budget laptop. Still, you can get up to speed nicely on it, and the addition of a proper numeric keypad on the right hand side suits me, but might not appeal to everyone. Just under the number pad is a fingerprint reader – a useful inclusion, bolstered by HP’s SimplePass 2011 software, which allows you to set up profiles for password-protected websites. The palm-rest of the dv7 is made from aluminium, and apart from the obligatory stickers features a fingerprint reader and a button marked with a globe emblem. Pressing this takes you to your home page, opening a web browser, if necessary. If a web browser is already open, it takes you away from the page you’re on to load your home page – something I had to keep in mind when writing this review for Reg Hardware in Google Docs. The glossy screen feels huge. It’s 17.3in across with a resolution of 1600 x 900, which is a reasonably good trade-off between size and pixel density. Yet it’s disappointing the dv7 doesn’t have a matt finish option. On bright, light-coloured screens – word processing, for instance – there’s no appreciable problem. Watching a dark, moody TV show such as The Killing, results in far too many reflections. The dv7’s all-round appeal is bolstered by the presence of above-par audio. It’s a Beats system, with a wide speaker bar running almost the full width of the screen at the back of the base, and a dedicated sub-woofer on the front-right underside of the chassis. You couldn’t exactly run a nightclub on it, but it’s certainly loud and reasonably punchy, and makes a decent fist of filling a room with sound.